For Experienced Candidates | sea-change, inc.
Sea-change developed the S.E.A.S. 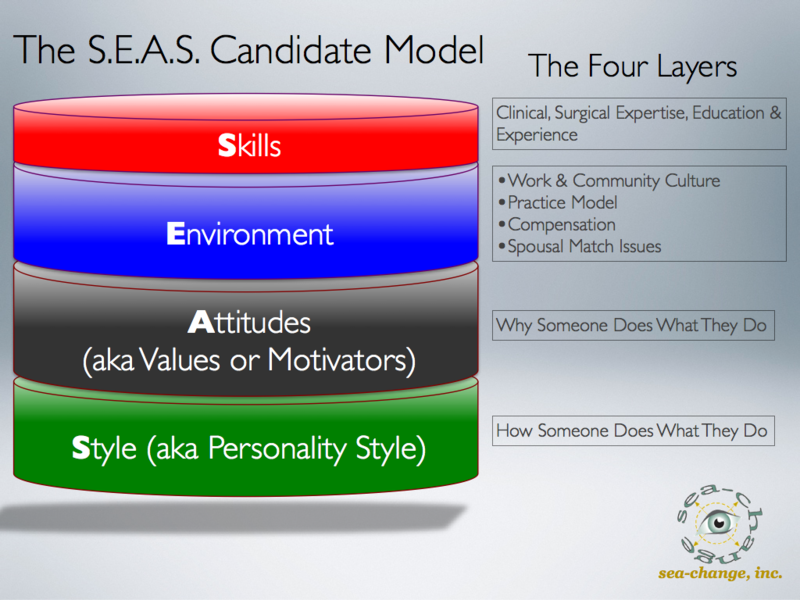 model that identifies the four dimensions of ophthalmic job/candidate fit. Anytime you’ve experienced an unpleasant or unfulfilling position, the root cause lies within the model. Here is our Ophthalmic Medicine Candidate objective assessment model. Note these are relative criteria, neither good nor bad. We classify candidates as either match, or no-match. Skills: the breadth and depth of your clinical and surgical skills. This layer symbolizes deep personal motivation. Why do you “do what you do”? What are your innermost desires, the magnets that draw you to certain activities? What factors repel you? Consider the peril if your core values and attitudes misalign with those of your new boss. Battles will rage and sides entrench. Both invariably decry, “ I know you’re wrong, and I’m certain I am right.” Value-based conflicts lead the culprit list for “practice divorces”. We consider Attitudes and Environment factors absolute criteria: e.g. Pass/Fail. They match yours or they don’t. When a practice meets those criteria, we proceed and then compare your Skills and Style. People get hired for what they know, and fired for how they treat others. Commonly called personality, style is simply how people choose to do their jobs. Factors include communication style, personal interaction, organization, urgency, customer service orientation, versatility, and more. What job situation best meshes with your style? If you inadvertently misjudge, buckle your seatbelt and prepare for a bumpy ride. Little irritations morph into major ones. Morale erodes. Emotions run unchecked. Unfortunately, style mismatches won’t reveal themselves until the end of the new employment honeymoon phase (weeks to months). Three skilled professionals will help guide your career: Your legal advisor, your financial advisor and your career advisor. sea-change forges career long relationships with most of our ophthalmic physicians. Why? Candidates who use us as their career coaches find jobs with greater fulfillment, in less time and at higher salaries than those who go it alone. Our fees are paid by the client practices that engage us… so having a sea-change expert in your corner is the easiest “No-brainer” decision you’ll ever make.